The Holy Name Society undertook the enormous task of first cleaning out and then filling in cracks on the school playground. 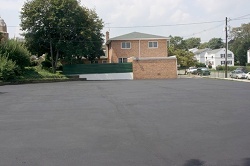 To protect the surface, they removed any debris then applied a 7-year-life sealer over the entire nine year old playground. The project took four days of working in 90+ degree temperatures to accomplish and was finished on Monday August 17, 2009 in time to start the new school year. In total, 72 5-gallon buckets of sealer were applied. Charlie Boyko, co-chairman of the project offered, "Not only will the newly-coated playground have a smooth jet-black appearance, but if a child falls, any scrape on the knee may be a bit less severe." The coating will also reduce future surface degradation and should help the asphalt pavement to last longer according to Charlie. Peter Baralecki added in closing,"Several HNS members who attended our parish school remember how much fun we had playing here!" Many thanks go out to the Holy Name Society for their hard work!